PIC Microcontroller Projects are posted here from basics to Pro. Hello everyone, hope you are fine and having fun with you life.Here I am gonna post all the PIC Microcontroller Projects links, which I have posted on my blog. I am gonna make it as guide, in which I will start from very beginning and slowly will move into the pro projects. First of all, I am gonna post about basics of PIC Microcontroller, how it works? how you can write program in it? What are the software used for PIC Microcontroller Programming? Which compilers are available for PIC Microcontroller Programming? etc. 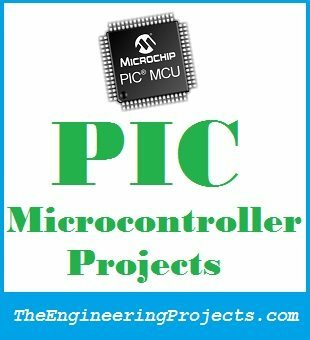 So, if you are new to PIC Microcontroller and you wanna design PIC Microcontroller Projects, then here’s the guide for you. Follow all these tutorials from beginning and if you feel any problem then ask in comments and I will try my best to resolve your issues. All the tutorial links below are completely designed by TEP team and thus TEP owns all the rights for these projects. They are for educational purposes and if you wanna share it then do mention us, that will be a great favor. And I am mentioning again that when you got into some trouble then do ask in comments and I will surely help you out.Moreover, you can also share your PIC Microcontroller projects with us and we will post them on our blog for the others to learn. So, now let’s started. Below tutorials are the basic tutorials for PIC Microcontroller, which are must learn for the engineer who are planning to work on PIC Microcontroller. Just read and understand them as they will go you the basic information about PIC Microcontrollers. If you already know the basics then you can skip this section but still I recommend you to read them once at least. Getting Started With PIC Microcontrollers ⇒ After covering the basics of Microcontrollers, next thing I have covered is the basics of PIC Microcontroller, because we are dealing with PIC Microcontroller Projects here. So, first we will have the basic intro of PIC Microcontroller and then we will move forward. 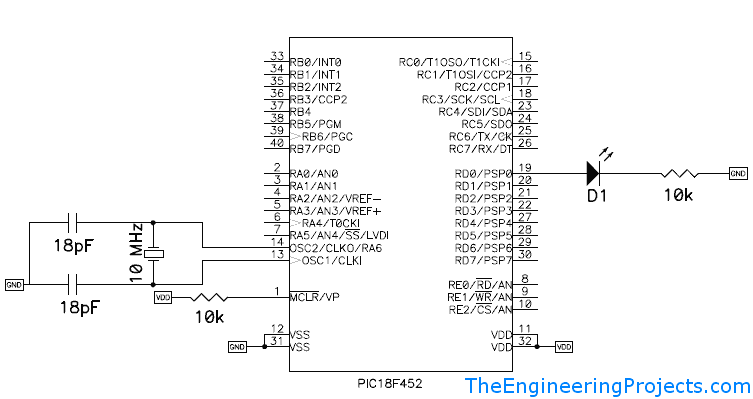 Functions available in PIC 18F452 Microcontroller ⇒ In this tutorial, I have discussed the basic functions available in PIC18F452 Microcontroller. I have used this PIC Microcontroller in most of my tutorials so that’s why I have first highlighted its main features. Top 3 PIC C Compilers ⇒ Now, we have decided which Microcontroller we are gonna use so now let’s discuss the C Compilers for PIC Microcontroller. So, I have discussed top 3 PIC C Compilers in this post and have a given kind of a comparison here. Its a must read post. MPLAB is official compiler from Microchip and thus is free to use while the other compilers are paid but they have trial versions for testing. Personally I like MPLAB compiler as it gives the complete control over PIC Microcontrollers. After MPLAB, I work on MikroC Pro For PIC Compiler, as it has many built in functions and libraries which reduces the codes and thus efforts quite a lot. How to Install MPLAB Software in Windows ⇒ MPLAB is official compiler of PIC Microcontroller so in this post, I have discussed in detail how to install this MPLAB software in Windows. 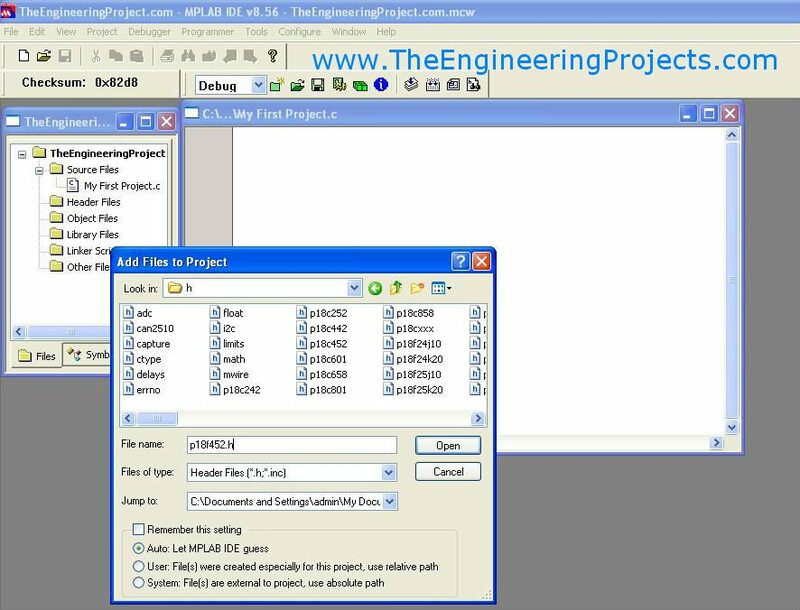 Using this software you can only design assembly language code for PIC Microcontroller. How to Install MPLAB C18 Compiler in Windows ⇒ Now that you have installed the MPLAB software so now its time to install its C18 Compiler so that we can write our codes for PIC Microcontroller Projects in C Language instead of Assembly Language. Getting Started With MPLAB ⇒ Now that we are done with the installation of compilers so now its time to get started with MPLAB software so that’s why I have given an overview of how to get started with MPLAB compiler. Below are different projects designed on PIC Microcontroller, I have posted them in sequence from basics to pro. The list is quite short rite now because I haven’t posted much on PIC Microcontroller yet but it will keep on increasing, whenever I am gonna post any new project on PIC Microcontroller, I will add the link below. LED Blinking Project on PIC Microcontroller ⇒ Its one of the very basic PIC Microcontroller Projects in which I have attached an LED with PIC Microcontroller and then design a simple project in which I have shown how to design an LED Blinking Project using PIC Microcontroller. Circuit Designing of LCD with PIC Microcontroller in Proteus ⇒ In this project, we have interfaced LCD with PIC Microcontroller. I have given the complete code along with the Proteus Simulation which you can download from this link. Interfacing of Keypad with PIC Microcontroller ⇒ In this project, I have interfaced Keypad with PIC Microcontroller. 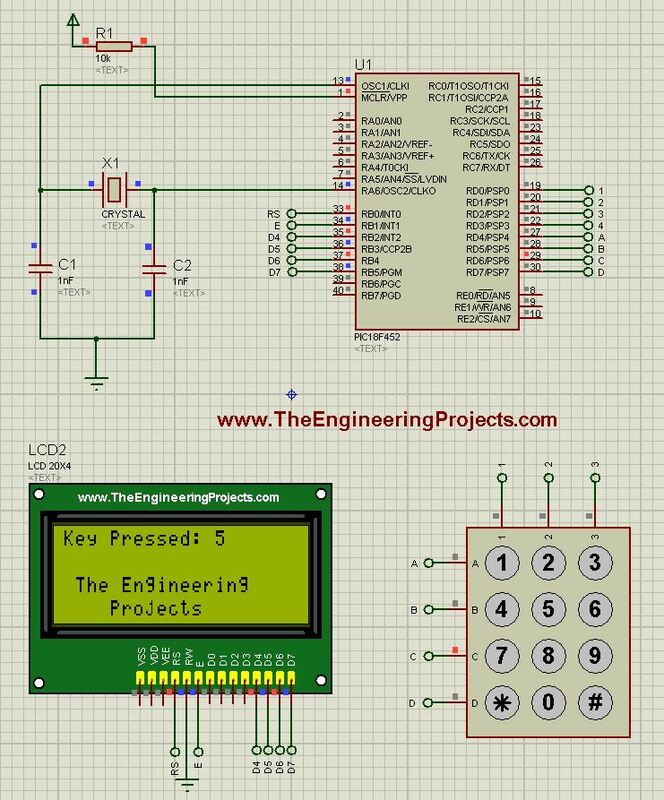 In this project when you press any keypad’s key then it will be displayed on the LCD. AOA, m final year student of EE. plzzzzzz i vl b grate ul if u help me in its coding. VSC and PIC Connection regarding load and capacitors bank. Add me on skype or call me on my number, both are given in contact us page , n let me know the details of your project, will surely help you out. i’m final year student of EE. plz help me to write micro c code for receive message. Send us a message on Skype and we will help you out. My Skype id is “theenggprojects” . Send me a message there. Thanks. hi sir,my project is smart notice board using gsm sim900 interface with pic16f887 with tft display.i have use microc code send sms from gsm to mobile it will receive bt i dont no how to send sms mobile phone to gsm module..it will display on tft lcd.please help me to how to receive message …..? Add me on Skype and we will discuss it in detail. My Skype id is theenggprojects. Can you please share a code for creating a menu & sub-menu on 16 x 2 LCD using PIC 16F877A. I need to create a prototype of automatic welding machine using siemens plc help me please. Add me on Skype and I will help you out. My Skype id is theenggprojects. i am student of electrical engineering ,we work on piezoelectric footsteps power generation using pic microcontroller .can you help in coding of pic16f877. Hi, please i want to write codes on PIR (passive Infra red) sensor using C language, thank you. dear sir! i have problem while uploading hex file to arduino mcu in proteus, arduino pro mini, simulino lilypad etc showing “initial contents of data EEPROM” what to do with this problem in protesu??? dear sir! i have problem while uploading hex file to arduino mcu in proteus, arduino pro mini, simulino lilypad etc showing “initial contents of data EEPROM” what to do with this problem in proteus?? ?